Presentation given at the conference Multimodality and Cultural Change, 2015, at Agder University. This reports form a work in progress where we look into the effect of the different digital tools that we ask the students to use. How do the tools influence on the mediated arguments that the students produce. An importatnt backdrop is the focus on digital competence (digital literacy) in Norwegian education. Digital technologies should be used in every topic. This is, however, not very dominant in Norwegian teacher education. Quite a few teacher students have skills with various digital tools, and they will be able to produce quite complex expressions. However, the majority of teacher students are less skilles, and should be given tools that are easier to use..
We are interested in how do students use visual, verbal, written and spoken elements to produce texts. And how do they use use these elements to support their arguments? A hypothesis is, somewhat obvious, that the different digital tools have profound influence on the products, regarding which and how the students include and use various media. As teachers we should pay attention to the modes and affordances that the various tools introduce, and how we can use this in the design of the assignments we present to our studebts. An underlying intention is that students sholud be introduced to tools and methods that they can take into their own practice as coming teachers. Digital argumentation is audiovisual texts, pretty much like digital stories. However, in digital argumentations the students are asked to take a stand on a topic that they consider significant. Where digital storytelling has a pretty consistent focus on video, we take a broader approach with digital argumentation. Two case studies as part of the students ordinary education. The students are in the 3. year of teacher education.The classes are of approximately 30 students, divided into 15 groups. 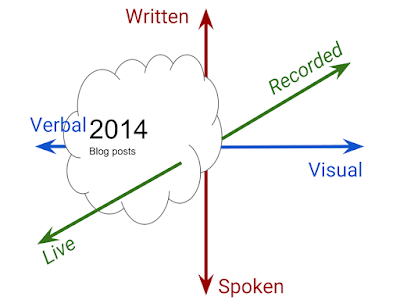 In 2014 the group of students was told to make blogposts with audio-annotated text. The students were given a quite specific instructions when it comes to the technical deliveries, bur "free hands" when it comes to the actual arguments. Assignment clearly defined: The students were given some resources that explained the technincal parts. We were quite specific about the technical deliveries. Before the workshop the students were given written instructions and videos, to ensure that there were as few technical difficulties as possible. The products were produced by the students without any direct instructions from the teachers, and presented and discussed in class. Presentation software of the students' own choice and an on online screenrecording service. The resulting videos were published on YouTube. The students were given general information about argumentation and shown how to search for images. There was no specific instructions about how to use written texts and images. The production process became more complex because the sounds had to be recorded, saved to the computer, published on Soundcloud and then integrated in the blogpost through yet another service - SoundCite. Arguments should be partly written text, with the supplement of five sound recordings. The students were free to decide on the functional weight between what was written and spoken. We are interested in the mix of expressions and how the tools and assignments work together along three dimensions.. In general the screen recordings from 2013 have a clear bias towards a recorded representation, without any need for a live component when they are presented. The videos are expressions that can stand alone. The chosen tools make the final product a video where visual and verbal modes are integrated in time. Video’s affordances also give priority to images and less emphasis on written text. There is a significant verbal component in the videos (from the 2013 case), but with a clear emphasis on what is spoken. The major parts of the arguments were presented by the students recorded voice. Video also makes the live dimension less significant, even when the videos were played in class. With the blog posts in 2014 the students were also told to work with recorded audio. This time we wanted to look into a closer integration between the spoken and written parts of arguments. However, given that playback has to be activated by the user, a stronger functional weight is given to written expressions. Blogposts with the spoken parts integrated viaSoundCite are clearly verbal. Most of the groups did only use one image, and there were no strong connections between verbal and visual modes. Activation of playback also makes the live component more important when the productions were shown in class. Video makes both visual and spoken elements integrated, and completely dependent on “discourse time”. Spoken words and visual elements are always in sync. When it comes to the verbal part, this seems to gives priority to what is spoken. There are only one group that clearly use written elements. Audio playback is activated by the user gives priority to what is verbal and written. The spoken expressions are only partly in “sync” with written expressions. 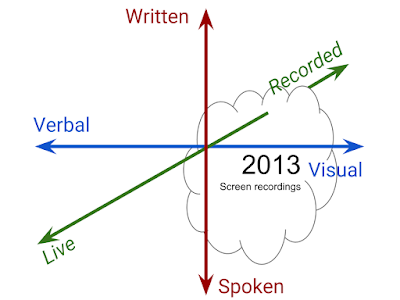 Screen recording leads to a closer integration between verbal and visual elements. This is of course not surprising, but something to consider when designing assignments. One may argue that digital arguments become more consistent with video, but video as an expression is hardly “digital specific”. What digital introduce to video, is another way of production. What might be interesting is to investigate how an interactive layer may be added to the videos. Like telling students to choose a video (e.g. from YouTube) and ask them to add their counterarguments on “top” of the video. This could be done with different tools, like Mozilla Popcornmaker. We will probably do something similar, for the third time, this year. Then the focus will be more on the relationship between written and visual parts of arguments. Investigating the use of tagclouds may be an approach.